Senior Enlisted Advisor to the Chairman is a military position within the United States Department of Defense and is the most senior noncommissioned or petty officer overall in the United States Armed Forces. The SEAC is appointed by the Chairman of the Joint Chiefs of Staff to serve as a spokesperson to address the issues of enlisted personnel to the highest positions in the Department of Defense. As such the SEAC is the senior enlisted advisor to the Chairman of the Joint Chiefs of Staff, and serves at the pleasure of the Secretary of Defense. The SEAC's exact duties vary, depending on the Chairman, though he generally devotes much time traveling throughout the Department of Defense observing training and communicating to service members and their families. The normal tour of assignment is four years, which runs concurrently with the Chairman. The first member to hold this post was William Gainey. On 29 September 2011, the Chairman of the Joint Chiefs of Staff, General Martin Dempsey, administered the Oath of Office to Sergeant Major Bryan B. Battaglia, USMC. Battaglia becomes only the second member and first Marine to hold the office. The other services followed during the Vietnam War, creating the counterpart positions of Sergeant Major of the Army in 1966, Master Chief Petty Officer of the Navy & Chief Master Sergeant of the Air Force in 1967, and Master Chief Petty Officer of the Coast Guard in 1969. The positions are generically or collectively referred to as "senior enlisted advisors" ("SEAs"). Only one Soldier, Sailor, Marine, Airman and Coast Guardsman can hold that rank at any one time (although they also hold the rank upon retirement per 10 USC § 1406(i)(1); moreover, the position's singularity is not deemed to prevent the technical overlap of a few weeks while a recently "retired" SEA remains legally on active duty for the duration of his accrued back-leave, known as "transitional leave"). Each advises his or her service chief (Commandant of the Marine Corps, Chief of Staff of the Army, Chief of Naval Operations, Chief of Staff of the Air Force, and Commandant of the Coast Guard) and other senior service leaders on all enlisted matters, makes decisions affecting enlisted personnel and their families, and is often invited to testify before Congress. When Admiral Michael Mullen became Chairman of the Joint Chiefs of Staff, he consulted the SEAs of the services and opted not to appoint an SEA in his own office. His office's press release stated that this was not a reflection on Gen Pace, merely that he did not feel the office was required. The position was reinstated in 2011 by Mullen's successor, General Martin Dempsey. Because Sergeant Major Battaglia is a Marine, he does not have unique collar insignia. It remains to be seen if the Army's SEAC collar brass, or variations of it, will be worn by future SEACs from other services. Although the Army approved the Joint Chiefs of Staff's request for unique collar insignia for the SEAC on 20 December 2005, the same memorandum rejected unique rank insignia, and CSM Gainey continued to use the rank title/acronym of a Command Sergeant Major (despite receiving the special SEA pay rate). 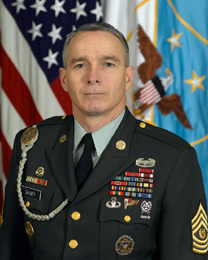 Consequently, as the Senior Enlisted Advisor to the Chairman of the Joint Chiefs, he is the senior ranking enlisted member in the U.S. Armed Forces, an Army incumbent wears theoretically inferior rank insignia and has a nominally inferior rank titles/acronyms to that of the individual services' SEAs. No decision has been made as to whether SgtMaj Battaglia and future Marine SEACs will wear a unique rank insignia. It remains to be seen if the other services will authorize unique rank (or a duplication of their respective SEAs' rank) when the SEAC is a member of their respective service. The Sergeant Major of the Army and the Senior Enlisted Advisor to the JCS Chairman are the only enlisted members of the United States armed forces, below general/admiral grade, to be authorized a positional color (flag). The SEA to the Chairman holds a VIP status ahead of all service SEAs who themselves are ahead of all 3-star/flag officers. Despite the unique duties and protocol position of this position, the Senior Enlisted Advisor to the Chairman remains a non-commissioned officer and, as such, is obliged to render salute to all commissioned officers and warrant officers. * - The position remained vacant from April 25, 2008 to October 1, 2011. ↑ Marine Corps Legacy Museum. ↑ Army Planner Colonel James J. Spinnel, in the Assistant Deputy to the Army Operations Deputy (Joint Affairs), to the Office of the Chairman of the Joint Staff, 20 Dec. 2005. ↑ "SEAC Heraldry" (PDF). United States Army Institute of Heraldry. 4 November 2005. http://www.ncohistory.com/files/Feb08/SEAC-heraldry.pdf.